Which Mobile Trigger works best for you? Those are good questions. After all, these mobile technologies all serve one purpose: to engage the target audience through a smartphone. The short answer is that each of these technologies has its own unique properties. So, depending on the objectives, audience, and context of the mobile interaction, you may want to apply one or more type of entry mechanism over others that could be less effective. 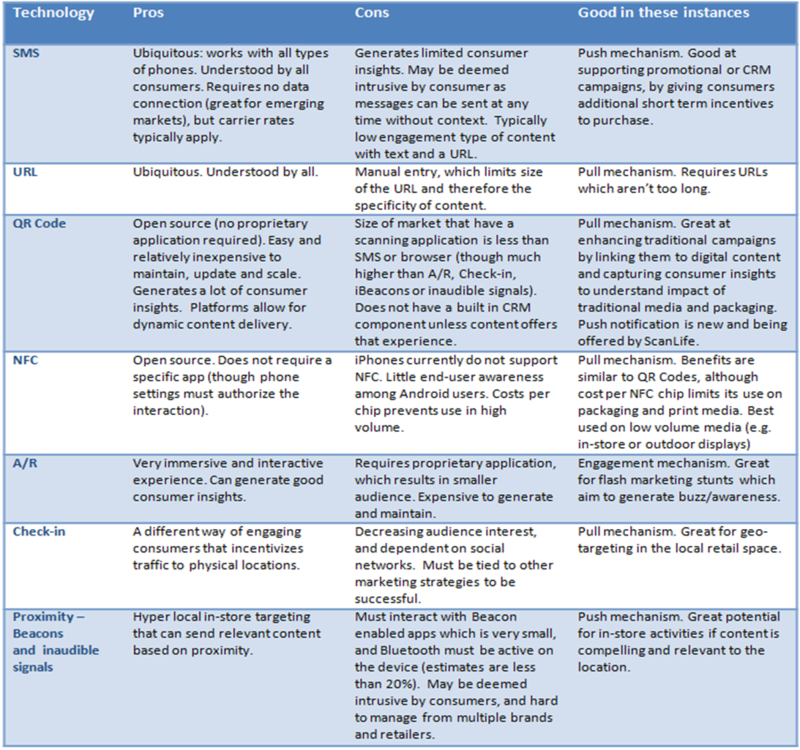 Since you insist, below is a comparison I’ve put together of all these technologies (click to enlarge). As you can see, taking a few moments to understand the pros, cons, and unique benefits of each technology can make a big difference in ensuring a successful promotion. Some mobile technologies are ideally suited to enhancing traditional marketing campaigns, while others are best for supporting in-store promotional activities. It pays to understand the difference. But don’t worry, you don’t have to memorize them all and, no, there won’t be a test. Just save this chart for future reference. The great news for ScanLife users is that our Engagement Platform is mobile technology agnostic – we can help you execute the mobile experience of your choice. Contact us to see how.